The tortured hand is a symbol of Japanese cruelty that was commonly practiced on Prisoners of War. The Japanese believed that a soldier should fight to his death--capture or surrender was dishonorable. POWs, considered sub-human and unworthy of life, were tortured or worked to death. The code of Bushido--a true honor code of ancient Samurai--was twisted by the Japanese WWII military. 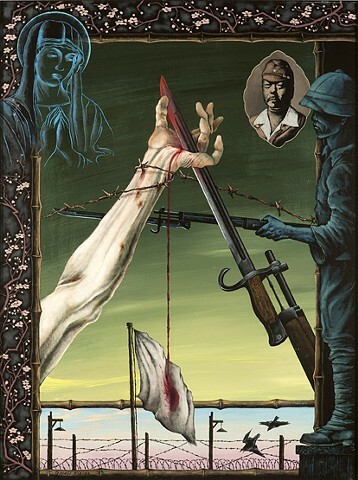 Above, a Madonna figure looks down on the scene with compassion and helplessness; while, across from her, is a portrait of General Yamashita, who was later tried and executed as a war criminal.